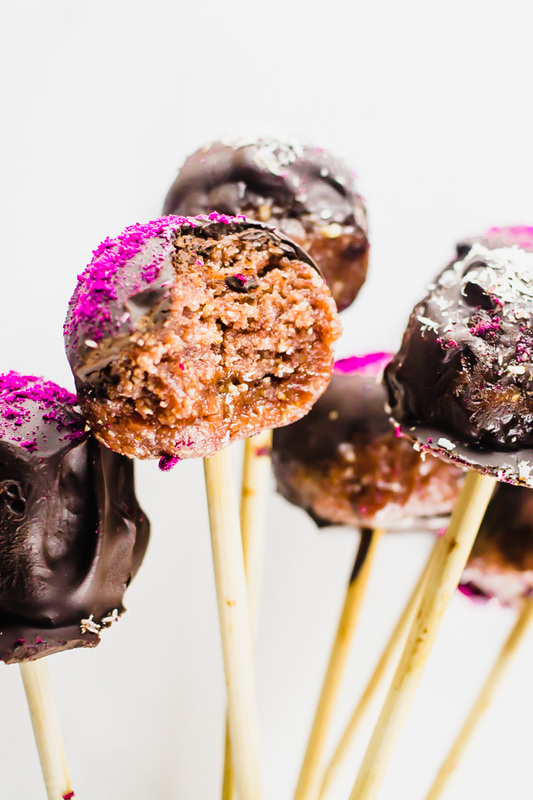 There's a story behind these easy raw vegan cake pops, and the story is that .. I have never had a cake pop, in my life, ever. Say whattt?! Yes. You read that right. I was always wary of those sugar-filled beautiful cake pop bites that stared at me at coffee shops that will remain unnamed. As much as I always wanted to take a bite out of one, or two or three, I resisted temptation and never gave in. Until today. Because vegan. And homemade. It's also refined oil free and refined sugar free and those two things in one recipe make me very happy, especially when said recipe is a dessert recipe. 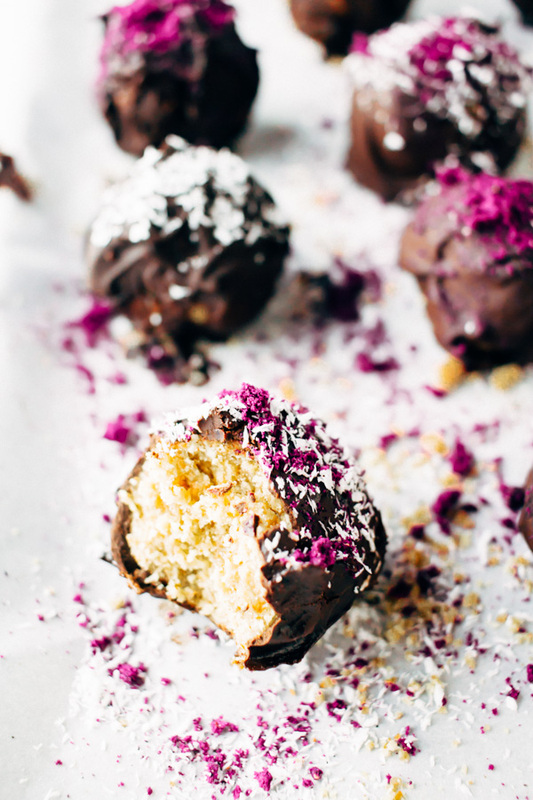 Because what's better than a dessert that is vegan, oil free, and sugar free? I'm not sure. And these are pretty darn good. They are also super adorable looking and perfect for Valentine's day. But still. February 14th takes the cake. 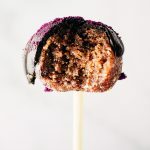 The raw vegan cake pop bite, cake. You can eat these as cake pops by inserting little sticks in them (I used skewer sticks), but feel free to eat as cake bites if you don't have sticks. 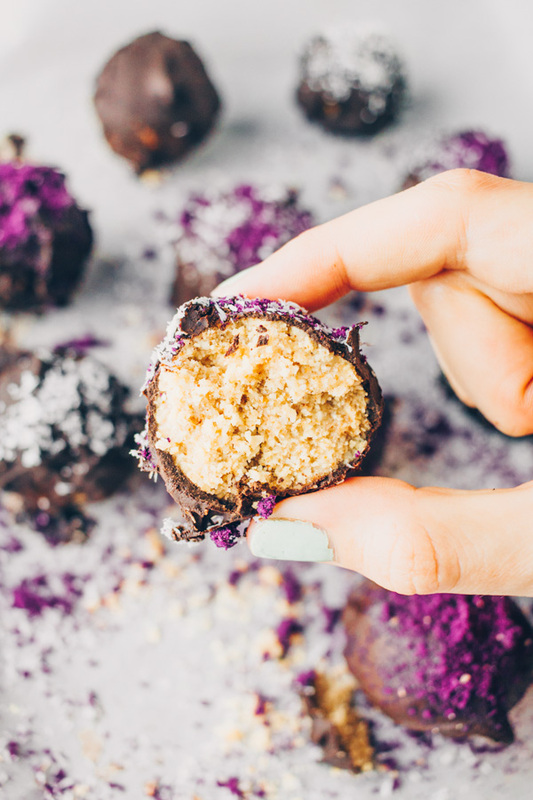 I use melted raw cacao paste (affiliate link) to cover the cake pops in chocolate, but if you don't mind oil - you can also use store bought chocolate chips or make your own chocolate sauce by mixing coconut oil and cacao powder. Raw cacao paste is bitter. I add 3 to 4 tbs of agave to sweeten it. It also becomes sweeter as the chocolate sets (usually overnight). If bitter chocolate is not your thing, then definitely go for the store bought chocolate chips option or oil/cacao powder combo. I like using raw cacao paste because it's raw, and it is free from refined oil and refined sugar which store bought chocolate chips usually have. This is the brand of cacao paste (affiliate link) that I have been buying for months, and I'm very happy with the taste and the quality. You can eat these within 20 minutes of making them, orrr you can let them set in the fridge overnight and they will taste evennn better. Especially if you are using raw cacao paste. The chocolate becomes less bitter when left to set overnight. I used cranberry juice concentrate to get a nice reddish color (for a Valentine's day theme), but you can totally leave this out and the cake pops will still taste amazing. I actually prefer the simpler version (without the cranberry concentrate) a little more. But, don't get me wrong, it's still tasty with the cranberry and it'll have a nice pink tint to it. Feel free to experiment with other colors such as beet or dragon fruit powder. 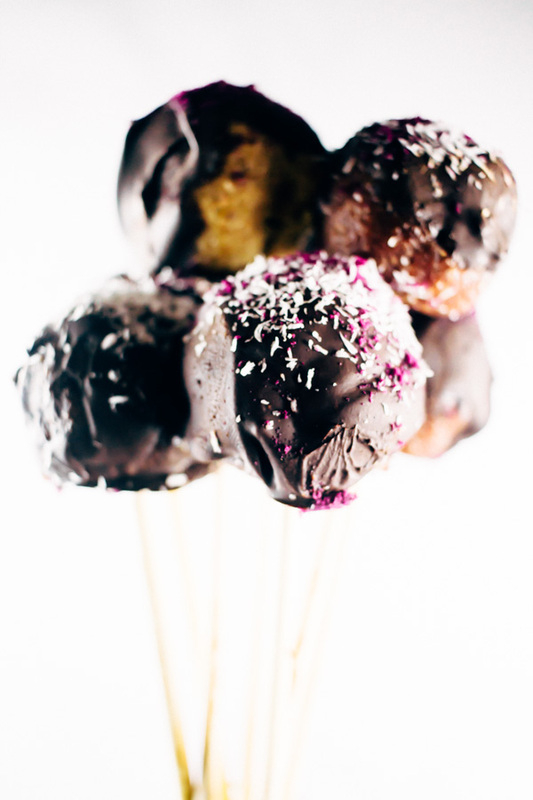 These cake pops are actually pretttyyy easy to make. Don't let words such as raw cacao paste and double boiler scare you off. Basically all you are doing is - mixing the main ingredients in a food processor, rolling them into 12 to 13 balls, popping them in the freezer and melting your chocolate while the cake pops set a bit. After 15 minutes, remove the cake pops, cover in chocolate, drizzle your choice of toppings and refreeze or refrigerate overnight. Bam! 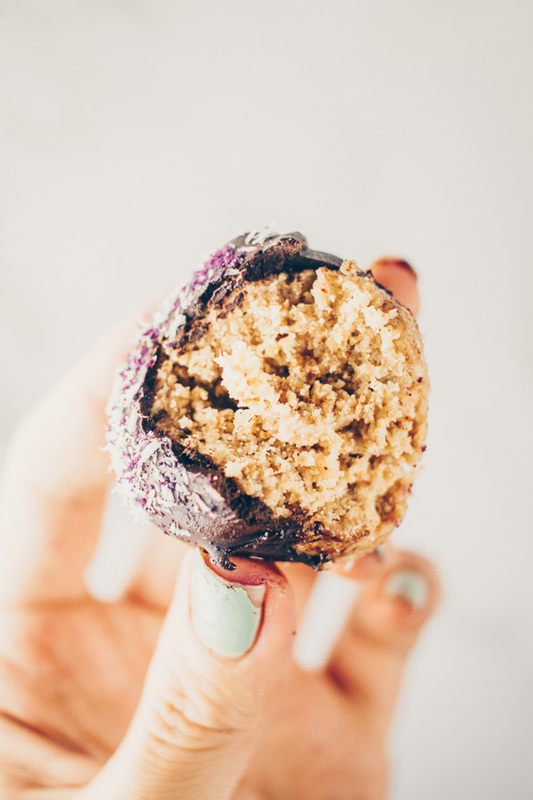 Super easy peasy raw vegan cake pops that are perfect for Valentine's day. 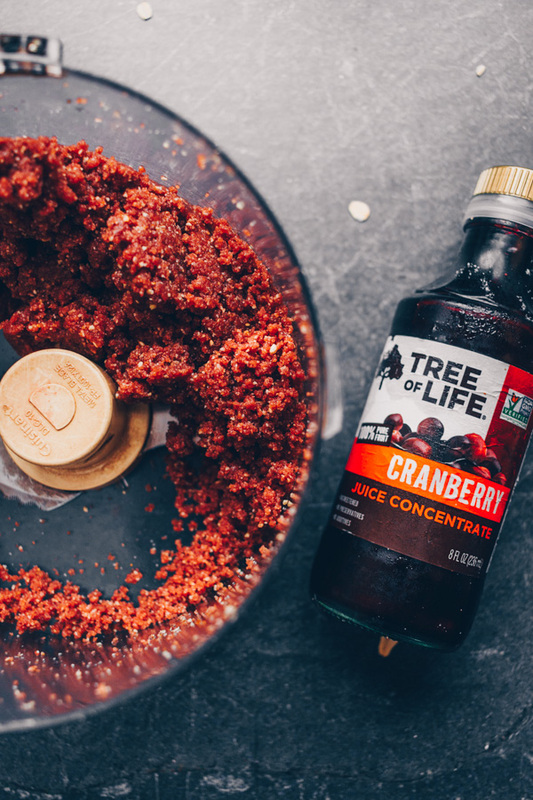 Optional – 2 tablespoons of cranberry juice concentrate (unsweetened). This is optional and it’ll give your cake pops a nice reddish color (see pictures), but it will also change the flavor. The cake pops with the cranberry added to them have a slightly more tangy, sour-y cranberry taste to them. Still delicious, but I preferred the regular cake bites vs the cranberry flavored. 🙂 You can also use beet root powder, or dragon fruit powder to achieve a reddish/pink color. 3 tbs of agave at room temperature* (or maple syrup) to sweeten the raw cacao paste which is naturally very bitter. If you don’t have access to raw cacao paste, you can also use regular store bought vegan chocolate chips and melt them. Or, if you don’t mind using oil – you can also use 3/4 of a cup of melted coconut oil and 1/2 cup of cacao powder mixed together which forms a chocolate-y sauce that will become solid when placed in the fridge. There is no need to heat up or melt this combo. Just add oil, cacao powder, and a bit of agave to a bowl and mix together with a spoon until a chocolate sauce forms. Place almonds, cashews, oats, dates, peanut butter (and any beet root powder or cranberry juice concentrate to change the color if you are using it), process in food processor until everything is completely broken down and the ‘dough’ begins to stick together. (see picture) If you are forming the balls, and they are breaking apart… you need to process the dough more until you are able to form the balls without them breaking apart. Roll into balls using roughly 2 tablespoons of ‘dough’ and place in a baking sheet. It’s normal if the dough is very crumbly.. use your hands to squeeze the dough together into a ball and it will eventually take form. Once all dough has been rolled into balls (about 12 balls), freeze for 15 to 20 minutes. From here you can eat the cake balls / cake pops as is or cover them with your preferred toppings. My favorites are coconut shreds, cacao powder, and dragon fruit powder. I found that the toppings stuck easily to the balls but if you are having trouble = you can add a bit of agave or date paste to help the toppings stick. If you want to cover in chocolate = Using a deep sauce pan filled 3/4 of the way with water, bring to a boil. Place another saucepan on top of it (to create a double boiler) and bring down heat to low. Add chopped cacao paste (or store bought chocolate chips) to dry saucepan and continue to stir until completely melted. Do not leave cacao unattended as it can burn quickly and it will ruin the chocolate. You have to continue stirring it frequently to balance out the heat and to prevent it from sticking to the pan or burning. Once cacao has completely melted, remove from heat and set aside to cool down for 5 minutes. Add room temperature agave (or maple syrup would work well here too), and stir until evenly combined. If you are using cacao paste, you will notice that the sauce will begin to thicken considerably. This is normal and it is due to the fact that we did not use any oil. You will still be able to cover each ball with the chocolate sauce (see picture), I use a spoon and it works well. 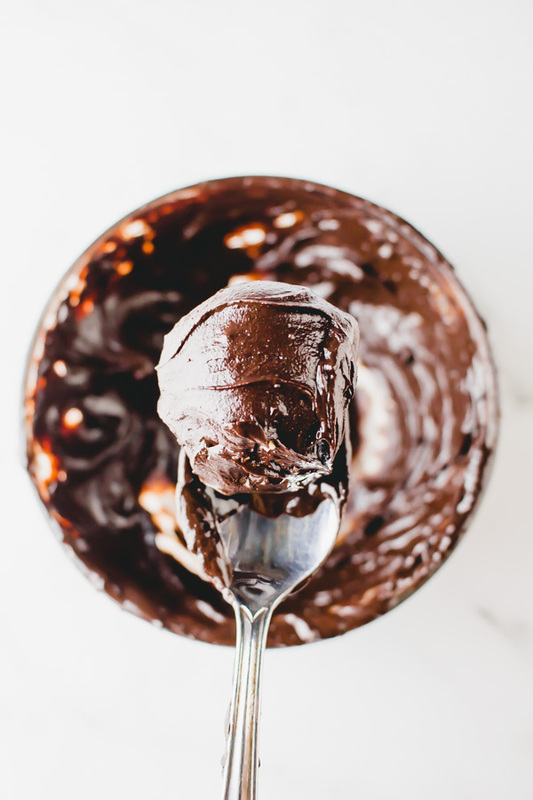 If you are using coconut oil and cacao powder – combine in a bowl, add agave and whisk until everything is evenly combined and you have a chocolate sauce. 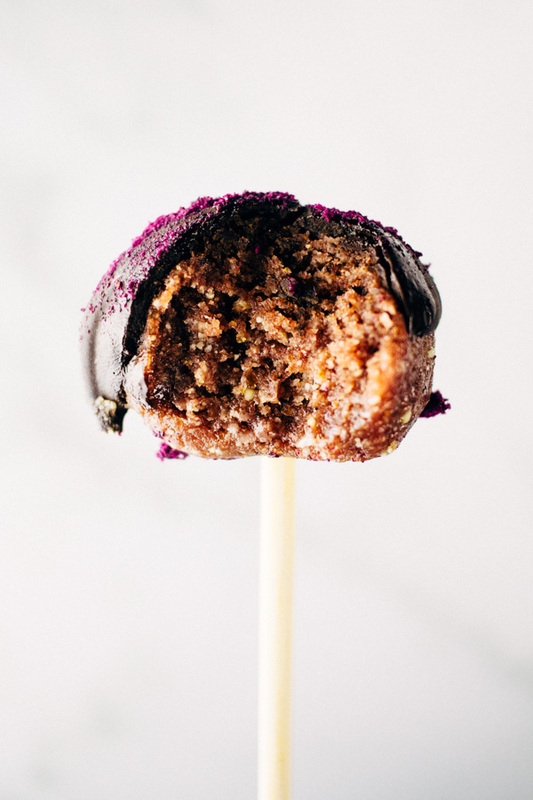 Before you begin covering the balls with chocolate – make sure to have any toppings ready (coconut shreds, beet powder, ect because once the melted cacao comes into contact with the cold cake pops the chocolate will begin to harden and then the toppings won’t stick. So, first make sure to prep toppings, and then begin covering the cake pops one by one with the chocolate. Then, add toppings as desired. Set back in the freezer and they will be ready to eat within 20 minutes. Or preferably set in the fridge overnight as these taste even better the next day! *Remember to insert sticks into balls before placing back in the freezer. I used empty kombucha bottles to hold up the cake pops as they were setting in the freezer. I like to use cacao paste because it is raw, and it is refined oil free and refined sugar free. It is the purest form of cacao because it comes from cacao beans themselves. Store bought chocolate chips usually have oil added to them and also sugar and other ingredients. You can use chocolate chips here and melt them as you normally would and cover the cake pops that way if you prefer. If you are using cacao paste like I did, make sure to follow each step as I mentioned it because cacao paste can be tricky to work with. Make sure to have the agave or maple syrup at room temperature, because if it’s really cold, it will cause the melted cacao paste to harden when mixed. I always bring mine out before starting the recipe so that by the time i’m ready to use it, it is already room temperature. I have not tried powdered sweeteners with this recipe, only agave and maple syrup in liquid form. You’ll need a double boiler to melt the cacao paste, it is the best way to melt it so that it does not burn. You can look up what a double boiler looks like, but it is very easy. All you need is a deep pot and a regular saucepan placed on top. In order to keep cacao paste truly raw, it should not be heated past 118 degrees, and some people prefer to use a thermometer to measure this and make sure they don’t go over. I’m not that strict, so I don’t do that step, but feel free to look into it and do it that way if you prefer. I’ve always wanted to try making a cake pop! Yours look so moist and I love that purple dust on top. YUM! Absolutely in love with this recipe. Your notes make it versatile and easy to adapt as well! Lovely pictures! You are so sweet Tania, no flowers needed, I’ll make these for you any time!! But, I do love flowers so feel free to bring some anyway 😉 haha Happy Vday! Oh man, I’ve made lots of cake pops before but never vegan ones! I’ll definitely give this a try! Lots of great flavours in this cute little treat. I love when simple ingredients come together to make wonderful things. What an incredible idea. I can’t wait to give these a try. Nice, I love having some recipes to make for my vegan friends. Thanks for sharing! Of course no problem! Your friends would love these. I love bliss balls. I am so happy you created these for valentines day! What a delicious idea. HOLD ME BACK! HOLLLDDDD ME BACK from eating ALL of these! I love little cake balls!!!! Hmmm…These sounds interesting for sure. Especially as an alternative. Nice post. I love the idea of finally trying to do at home something you never had before. I would definitely want to test this recipe soon! These look so good! What a fun and easy dessert idea. Thanks for sharing! Thank you Katherine! I’m hopping over there right now to check out the post.